The lines and styling of the two cars are remarkably similar. There is always something happening at Wheels Through Time, and this summer has been no exception, with the acquisition of a unique Harley-powered race car. The car, purchased by Dale in California, came with an unusual story; it was built for and owned by Otto Kahn. The name Otto Kahn may not be familiar to you, but I can almost guarantee that you will recognize his picture. Otto Kahn born February 21, 1867, was a well-known and wealthy investment banker and he also served as the inspiration for “Mr. 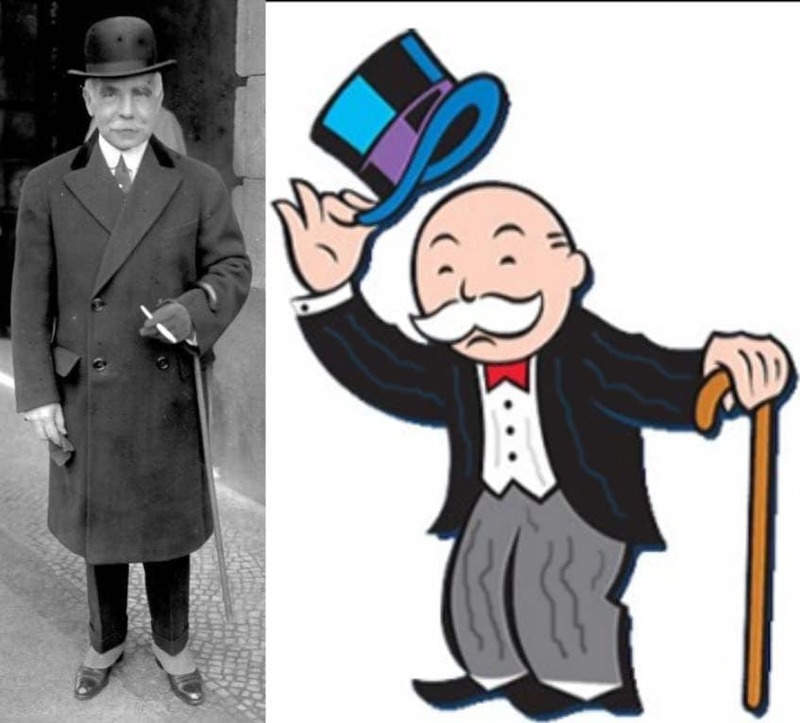 Moneybags,” the icon of the board game Monopoly. Once you realize who Mr. Kahn was the similarities between this car and the “race car” found in the Monopoly game are too much to be considered coincidental, leading us to believe that this car was the inspiration for the gaming piece. Not only did the car have a storied history but its design was out of the ordinary as well. The car features a 1929 Harley JDH powerplant, unusual in the fact that Harley only made around 500 of the JDH motors compared to the JD. The JDH was the high-performance motor of its day alluding to the desire of Mr.Kahn for a fast machine. The car also features four-wheel brakes, planetary gear steering from a Model A Ford, and a rear differential. When Dale acquired the car, it was in rough shape, despite its streamlined design and beauty. The past 90 years had not been kind to it and almost every part that could be rusted tight was. Despite wanting to get started working right on the car right away, Dale knew in this situation, patience was crucial and so begin a regular process of spraying every moving part on the vehicle with penetrating oil. Later, with the motor now loose enough to turn over, Dale set to work to see if he could get it running. With his traditional method of heating the motor up with a hot plate, and the addition of a new coil pack for spark, Dale had the engine turning over, firing and then running. Unfortunately, before he moved any further on it, a more pressing project came along, and the car sat waiting for its next dose of attention. Flash forward to a few weeks ago, with Wheels Through Time experiencing record attendance numbers this year, we decided we wanted to do something special for those who are visiting and getting the “Monopoly Car” back on the road seemed like a great project. Matt and I set to work on making it a reality. The process began with a careful evaluation of what was needed. All the dash controls were rusted tight and had to be broken loose, and there was also the issues of brakes, transmission, and chains to deal with. It wasn’t long however until we were down to only one remaining problem that was holding us up, the fuel system. Matt went to work on the carburetor, which he ended up replacing because the original one was in need of a total rebuild and I began to address the issues of the Auto-Pulse fuel pump which, unfortunately, was pumping poorly and leaking. Being this close to firing the car up, we weren’t going to let a leaky fuel pump stand in the way. We found a more modern pump and regulator in the shop and plumbed them in temporarily. With the new pump in place, Matt kicked the engine over on choke. Once fuel had made it to the carb, we turned on the ignition switch and just a few kicks later the car roared back to life. Another rare and beautiful machine finds its home at Wheels Through Time. Of course, with the motor running, clutch working, transmission shifting and brakes doing their job, there was only one thing left to do. DRIVE IT! The car performed magnificently, and it almost seemed as if the past 90 years had passed in a moment. It accelerated quick, handled well and had plenty of power to spare. We estimate its top speed would be somewhere in the neighborhood of 60-70 mph. In the days that followed Matt dialed in the engine and I rebuilt the original Auto-Pulse fuel pump with spare parts we had as well as a new gasket kit. When all was said and done, we ended up with another rare piece of American history. A car built by one Americas’ richest men, using one of Harley’s rarest motors and inspiring one of people’s favorite games. The car is now run regularly for guests and can be seen at Wheels Through Time. You can also watch the video of the work we did on daleschannel.tv your resource for the best videos of what’s happening here at WTT.